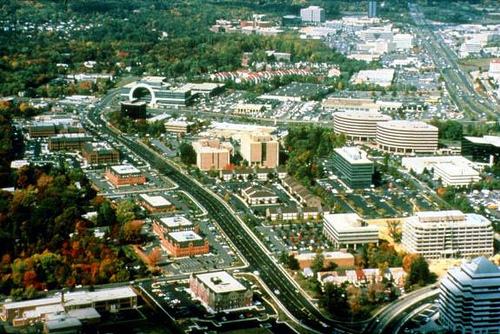 Do firms want to be in suburban centres? We know that most jobs in Melbourne are now in the suburbs. There’s also an increasing understanding that large metropolitan areas are now generally polycentric rather than monocentric in form i.e. there are significant activity centres outside the CBD with large numbers of jobs. The strategic planning update to Melbourne 2030, Melbourne @ 5 Million, released in October 2008, explicitly acknowledged this reality. It is clear that firms can increasingly obtain the benefits of density, such as face-to-face contact, in both inner city and suburban centres where they don’t have to carry the extra costs in rent and congestion imposed by the very high density of the CBD. The CBD’s share of metropolitan jobs has consequently fallen significantly over the last 30-40 years (it has staged a small revival since 1996, showing significant jobs growth in absolute terms, but its share of metropolitan jobs has not increased). Yet many studies in many countries have found that while the number of suburban and inner city activity centres is increasing, the proportion of jobs located within them is falling. In fact, around a half to two thirds of employment in US cities is scattered across the metropolitan area at relatively low densities. Inter-city and cross-country comparisons are difficult, but the evidence suggests that suburban jobs are even more scattered in Melbourne. It seems that firms can increasingly achieve the benefits of agglomeration at a larger geographical scale than that of the CBD or suburban activity centres. The advantages of physical proximity have apparently declined to such an extent that the costs of aggregation now exceed the benefits at ever lower levels of density. But why are firms increasingly spurning density? It is often argued that technological advances like the internet and mobile phones permit virtual communication to substitute for face-to-face contact. Rather than locate in the CBD or in suburban centres, firms may choose to establish, say, in the suburbs where they can minimise their operating costs while retaining a high level of connectivity. A classic example is call centres which are sometimes even found in industrial estates. However a contrary view is that technology and the rise of the information economy have the opposite effect – like the telephone, newer technologies like mobile phones and e-mail actually increase the demand for face-to-face interactions and therefore increase the demand for density. While call centres or “backoffice” functions like financial processing that deal in highly codified information are relatively footloose, those that deal in nuanced and ambiguous information are highly dependent on face-to-face communication. Thus in many cases electronic communications are a complement to, not a substitute for, face-to-face contact. Another explanation for the scatter of jobs is that even if advanced communication technologies do indeed promote rather than diminish demand for face-to-face contact, it may nevertheless be achieved without the need for high densities. Edward Glaeser and Mathew Kahn contend that since the key purpose of agglomeration is connection with others, agglomeration effects may in some circumstances be achieved as easily when people drive as by walking or riding public transport. The primary need is ease of movement and the key determinants are the quality of transport infrastructure and the average density of activities. They argue that the number of jobs within three miles of downtown Palo Alto (Silicon Valley) or Tyson’s Corner (the archetypal US edge city or suburban centre) dwarfs the number of jobs in the traditional downtowns of older cities. As such, “edge cities are true agglomerations, they just involve using automobiles”. The use of cars to achieve intense CBD-type inter-firm linkages over an extended geographical area has been extensively documented in the Silicon Valley area. I think there’s a third explanation which is more relevant to Melbourne. As Paul Krugman points out, most jobs in cities now relate to what residents do for one another rather than what they do for the outside world. Rising household incomes have led to rapid growth in demand for personal services – for example in education, health, transport, financial advice – and to increased out-sourcing of traditional household tasks such as grooming, dining and entertainment. The firms that meet this demand are business-to-consumer rather than business-to-business oriented so their primary aim is to be accessible to their customers. They don’t benefit that much from intense agglomeration economies and accordingly tend to cluster in relatively small centres that are often below the radar of most definitions of significant activity centres. In other words, most job growth is in industries that don’t need (or want) very high densities. All of this has major implications for suburban centres policy. There are of course some firms who want to locate in them but find it too expensive due to restrictions on development. Other suburban firms, probably most, actively don’t want to be in very large, dense centres.